QCA are pleased to publish this profile of The Cat and Kitten Care rescue in Hertfordshire, submitted by our member Joan How. Whilst involved in work for our fellow creatures I have been fortunate enough to develop worldwide contacts with several caring and compassionate animal advocates. Each contact is endeavouring to meet the animal concerns that are prevalent in their own country. One such worldwide concern is the care of those fellow creatures that are abandoned, and, all too often, are abandoned due to sickness and injury. Such fellow creatures are never easy to rehome and often require long term treatment. It was during the course of one such conversation with a fellow UK friend that the Cat and Kitten Care charity was mentioned to me. I made contact with this small charity that operates from Walthamstow London and Ware Hertfordshire, and was kindly extended an invitation to visit their Ware centre. It is a policy of the charity not to rehome cats/kittens in rented accommodation unless the cat owner has a long term lease and proof that they are allowed to have a pet. A thorough check is always undertaken by the charity to ensure that their requirements are adhered to. The charity will also neuter and release feral cats where appropriate. Feral cats can be dangerous animals to try and deal with. The charity has had several feral mothers with their kittens to care for over the years, and in most cases it has been possible to tame and rehome the kittens, but the mothers are far more difficult to deal with. Where ferals have been removed from gardens the charity will always try to get them neutered and returned to the area they know, as long as there is a food source for them and some degree of shelter, a shed or outhouse etc. Sadly with feral cats it is unfair to release them if there is nobody to feed them and care for them. Once trapped and released it is very difficult to trap them again and if they develop serious health issues they could suffer. Feral cats are tenacious and continue to put up a tremendous battle even when they are gravely sick and close to death which is unfair on them. In consultation with a vet, those feral cats with long term medical problems who will not get the ongoing medical care they require are euthanised. If, however, medication can be regularly administered the feral will be cared for. An example of this was when a lady found a stray cat underneath a bush during last year’s hot weather. The cat was in a bad way, elderly, 16 or 17 years of age, and found to have a thyroid problem that had been untreated. ‘Dora’ as she was named, was cared for by both the lady who found her and the charity, covering medical costs between them, until such time as ‘Dora’ passed. The charity has approximately 15 volunteers who assist with table top sales, however it is Fran and Mary who rescue and care for the cats. They are only a very small charity and it is extremely hard to find people with the commitment to foster cats long term. They have received offers from people to foster for a couple of weeks but in reality some of the cats have long term health problems. They find people willing to help as long as they can take holidays etc. Sadly in this type of work there is the need for long term commitment as it would be inadvisable for the cats to be moved from home to home. 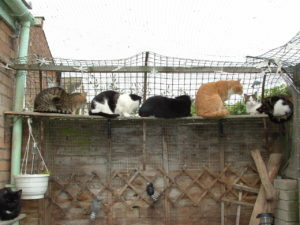 As there are no cattery facilities, it has been found best to house the cats with Fran and Mary as it makes it far easier to know how many cats they are dealing with and to plan for the future. Since the charity started it has been estimated that over 1,000 cats and kittens have been helped in some way or another. Many have gone to new loving homes and those unable to attract new homes stay with Fran and Mary. A cat is never put to sleep because nobody wanted it. In 2014 an unidentified virus infected many of the cats, in spite of veterinary treatment and investigation many cats were lost in a short space of time. Fran Meyer now cares for those cats who, since being infected, cannot be rehomed and who may require long term treatment as a result of the virus. There are 32 in number living in Ware in a secure area with pleasant surroundings. 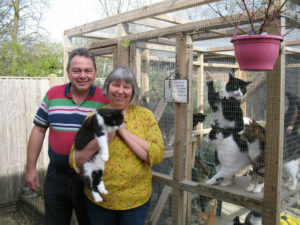 Mary Farrington cares for 21 cats in Walthamstow. 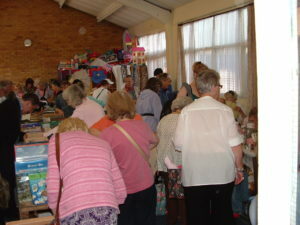 All volunteers are committed to raising funds and regularly hold table top sales, and quiz nights to help with ongoing veterinary costs and food. Our thanks must go to all concerned with cat and kitten care for the caring and compassion they extend to our fellow creatures. Read more about their work in their latest (Winter 2018) newsletter.